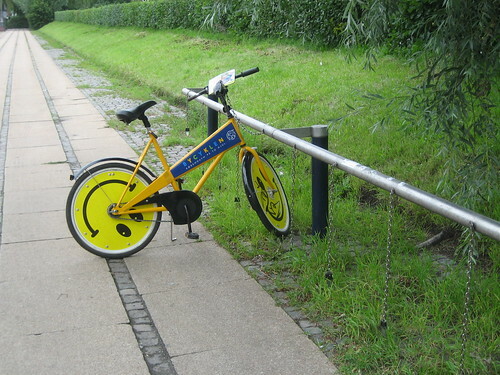 The famous Copenhagen City Bike. Works on a shopping trolley system. Put in a 10 or 20 kroner coin [ca. 2 or 4 dollar] coin and the bike is yours. Just park it at another bike rack when you're done. They're not that comfortable but they're practical. Hard rubber tyres, a map on the handlebars (for tourists), adjustable seat. This system was started back in 1995. It's was the first bike share system in a major city and it later inspired the systems we now see all over the world.